I recently shared an idea for Sensory Water Bags with The Activity Mom. She liked it and decided to feature it on her blog, which is totally flattering because she has a million GREAT ideas! Recently, when I was reading about Sensory Bottles on her blog, it reminded me of Sensory Water Bags I had made for both Logan and Tyson as babies. Basically, you just fill a ziploc bag with water, add little things that you want your baby to get to touch but that you don't want your baby to put in his mouth, and tape closed. 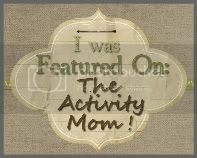 Nicole, "The Activity Mom ", has great photos of the activity so go check it out. Pretend Play- Grocery Store- This is a budget friendly DIY grocery store play area. I can't wait for Logan to get more into pretend play!! Buttons, Buttons, Buttons and Spaghetti Noodle Lacing I've been wanting to start lacing with Logan and these were great ideas for me! As you can see, I've used her site a lot to find things to go with skills I want to work on with the boys. One more thing that I like about this site is that she links back to the people who shared the idea with her. I think that is awfully nice! And today... it was me. Hooray! Oh you are so sweet! Thanks for linking up and of course for the great ideas!